One of the biggest “gaps” in my own education is in my understanding of history. It was never presented to me in a way that I could wrap my brain around. I still struggle with seeing the big picture. So I’ve become obsessed with creating a big picture of history. Literally. I want to make a wall timeline. Isn’t that cool? I’ve been racking my brain for where in the world to put something like this in my house. 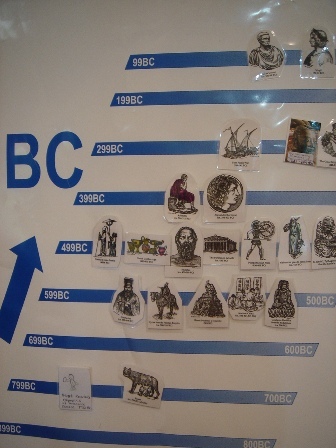 I even found a lovely free printable timeline at a fellow homeschooler’s site, GuestHollow.com. Just the A.D. part of it is 70 pages. I did the math. I would need about 50 linear feet of wall space. I don’t have that. The Guest Hollow timeline is meant to be put in a notebook. It’s awesome for that. Notebook timelines are great, but my brain needs to see the big picture. The whole picture. All at once. It goes up one side for the years before Christ, and then comes back down the other side for the years Anno Domini. The one pictured above came from this squidoo page. It’s published by Konos and comes with the printed pictures. This is perfect. This gives the big picture. Of course, I’m not willing to shell out the cash for the premade timeline. And I’m not terribly interested in what someone else thinks I should put on the timeline. So I’m going to make my own. Other people have done it. Here’s one from Kindred Blessings. Here’s a pretty amazing one from Peace Creek on the Prairie. And a really neat one from Higher Up and Further In. And here’s a really great how to with specifics for spacing and such. Lots of ideas. I’m still trying to figure out exactly how we’ll do ours. But I do know where we’ll put it. The only wall in the house that can accommodate such a monstrosity is in our dining room. The wall has been blank for the two years since we moved into the house because I’ve been waiting to discover the perfect display for it. I was thinking of a brightly colored still life. A giant cluttered timeline wasn’t really what I had in mind. Which brings me to a whole new issue. When you put one of these bad boys in your home you are declaring, loud and proud, we are homeschooling geeks. Our house is for living and learning. It will never ever be featured in Better Homes and Gardens. I’m okay with that. Mostly. I can almost guarantee that through the years this timeline will provide much more fodder for dinner conversation than a depiction of flowers in a vase. No matter how lovely those flowers might be. But a fairly large part of me longs for a tastefully decorated house. But, I think I’m willing to sacrifice that for what I think a timeline like this can do for our family. Living with this timeline will give my children the opportunity to document what they learn through the years. It will help them revisit what they’ve learned each time they add to the timeline, and see how things all fit together. They’ll be able to see that while the United States was busy fighting the Civil War, Franz Shubert was premiering a new symphony. They’ll be able to see how the Saints and the history of the Church fit into the rest of world history. Their knowledge of history will build on itself and will be constantly reviewed so that they will really know history. It’s something I’ve always wanted for myself. So this ugly timeline will be a gift to me and to my children. I’ll post pictures when I get it up. Mikaela and I did a U.S. history timeline our first year of homeschooling. We both loved it. Such a fun project! Enjoy.